April has had this dish on the menu since Breslin opened. This is definitely a fall challenge for advanced charcutepaloozians! Thanks, April and Peter for the recipe and Peter for your great iPhone process shots! Combine all the above spices and pulverize in a spice grinder. Using a sharp boning knife, carefully tunnel the hock from the skin down to the first joint. Be sure not pierce the skin. 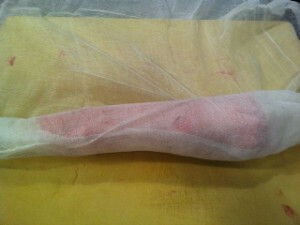 You will slice the sinew away from the skin and pull the detached skin towards the foot. Like rolling down a sock. Cut the hock from the trotter at the joint using a meat cleaver. You are removing the hock from the foot, the forearm from the wrist, as it were. 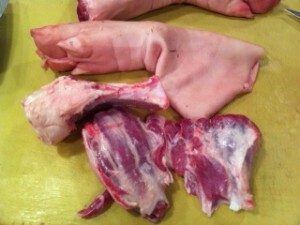 You will need to use the meat around the hock for the cotechino farce (stuffing). Use a boning knife to remove the meat from the bone on the hock, but be sure to cut out any of the tough tendon you’ll find in the hock. Discard the bone or save it for stock. Meat removed from the hock. Weigh the of meat from the hock. Multiply this weight by .75; add this amount of pork skin. Multiply the weight of the meat by .25 and add this amount of fat. That is, if you have 12 ounces of meat, you would add 9 ounces of skin and 3 ounces of fat. This will double the total weight of the farce which will be enough to stuff the hock end of the foot. 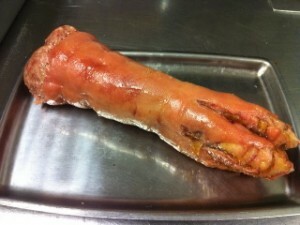 (The trotter will hold about 13 ounces/370 grams of meat). Cut all the meat, fat, and skin in to 1-inch/2.5 centimeter cubes. Put them in the freezer for 15-20 minutes or until they are slightly frozen. Combine the meat, fat, and skin and grind once through a medium die; once all the items are ground, place it back in the freezer for 15-20 minutes. Grind the meat mixture one more time through a small die. In a small dish add 1/2 tablespoon of salt and 1/2 tablespoon of 4-spice. Place the chilled meat mixture in the bowl of a 5-quart mixer with a paddle. Sprinkle the salt and spice mix over the meat mixture and paddle it for 1 minute on medium speed, then add a little ice water until it becomes slightly tacky and comes together. Cook a small amount of the farce to evaluate and adjust seasoning. Stuff the cotechino into the end of the foot. 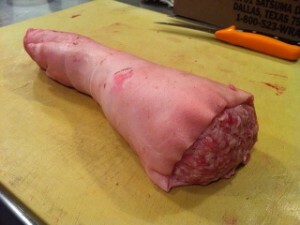 Once stuffed, it will take its original shape of the bone-in pig’s foot. 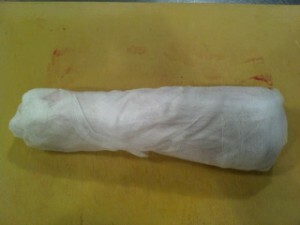 Cut a 3-foot/90-centimeter length of cheesecloth. 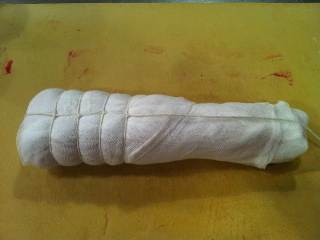 Place the stuffed foot at one end of the cheesecloth. 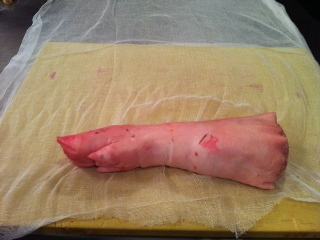 Roll the pig’s foot with the cheesecloth half way down the length of the cloth and fold the ends in so that the open end of the foot is covered completely with the cheesecloth. With the ends tucked in, then roll the pig’s foot the rest of the way down. Tie the foot, starting from the open end, with butcher’s string,leaving about 1/2-inch to 3/4-inch space between. Start at the open end so that the farce gets pushed in to the foot and not out. Tie it as you would a pork loin. Tying the stuffed pig’s foot. Once wrapped and tied, place the pig’s foot in a pot that is large enough to hold the foot; then add enough chicken stock to cover the foot and poach for about 4-5 hours. The trotter should feel a bit floppy when you poach it. 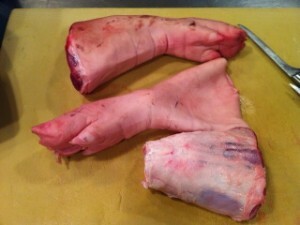 You will know it’s done when you can gently squeeze the trotter and feel the bones shift near the foot end. If you can feel this, then the foot is done. 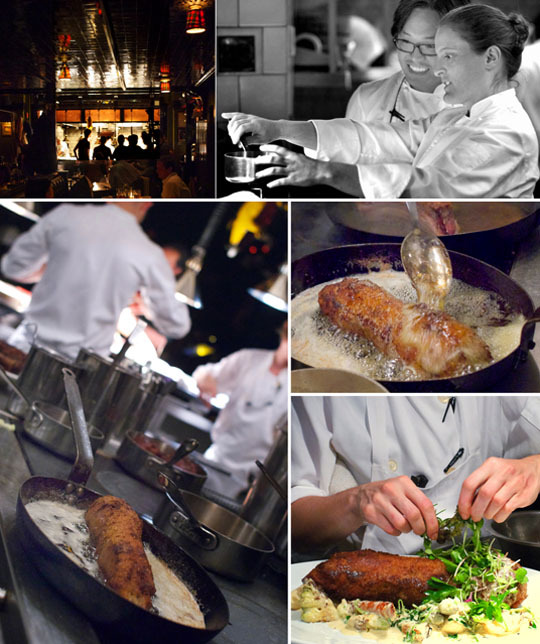 The long cooking time will also make sure that the skin in the farce becomes sticky and soft and not chewy. Let the foot cool completely in the poaching liquid; you can even leave it in the liquid overnight in the refrigerator. The colder the trotter is, the easier it will be to work with, especially when you bread it. Preheat the oven to 375-400 degree F./190-200 degrees C.
Place the bread crumbs (Breslin uses filone for theirs, or basic pullman loaf crumbs) on a sheet tray and coat the pig’s foot completely in the crumbs. 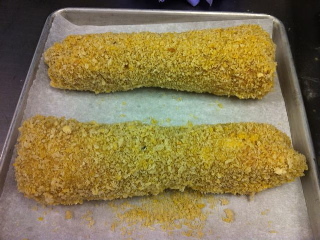 Pig’s foot rolled in bread crumbs, ready to be sauteed. Place a large saute pan on medium heat with enough olive oil to cover the bottom of the pan to about a 1/2-inch thick. Once the oil is hot, add the breaded pig’s foot to the pan and slowly fry off the foot turning it, so all sides lightly brown. Once all the sides are brown add about 2 tablespoons of butter to the pan and place in the oven. Turn and baste the pig’s foot with the oil and butter until the foot is completely heated through and buttery golden brown all the way around. About 30 or 4o minutes, building the color gradually but with steady heat so it doesn’t get greasy. Serve whole with seasonal sides dishes.